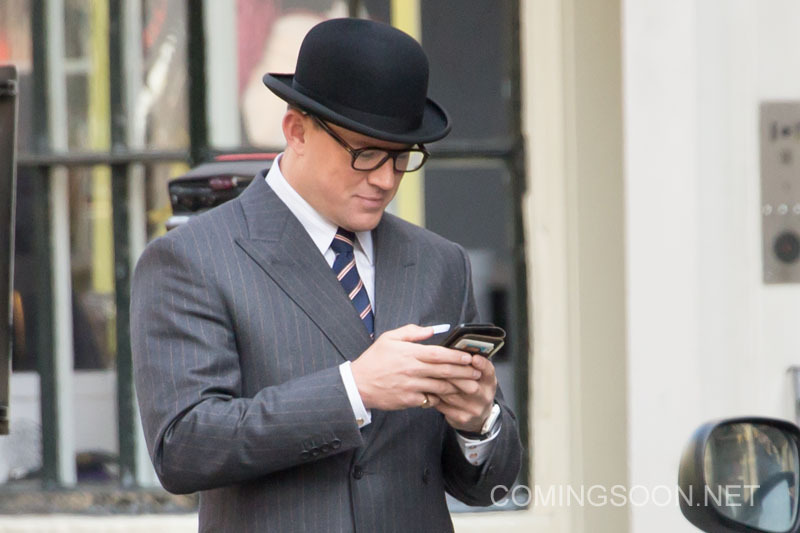 Last month we learned that Channing Tatum would be joining the cast of Kingsman: The Golden Circle. Now, with the film currently in production in London, we’ve got the first set photos of the actor in action, looking dapper in costume as he goes about some business. We don’t know specifics on who Tatum is playing, but from what we’ve heard he’s an American agent who’s presumably working with Taron Egerton’s Eggsy, who’s over in the States visiting “Statesman HQ,” where a “swaggering, sharpshooting cowboy” named Jack and another figure named Ginger (Halle Berry) run the show. Could Tatum be stepping into the role of Jack? It certainly seems probable. Regardless of who he plays, the Magic Mike star is a solid addition to what’s an already stellar cast. His charisma and likeable screen presence will no doubt compliment the franchise quite well and hopefully ensure that the sequel is just as fun as the original Kingsman was. Kingsman: The Golden Circle hits theatres on June 16th, 2017 and aside from Tatum also stars Taron Egerton, Halle Berry, Mark Strong, Julianne Moore, Pedro Pascal and Sir Elton John, among others.